LAT - Niew Landt Kaartie Vande XVII Nederlandsche Provintien. LAT, Jan de - Niew Landt Kaartie Vande XVII Nederlandsche Provintien. 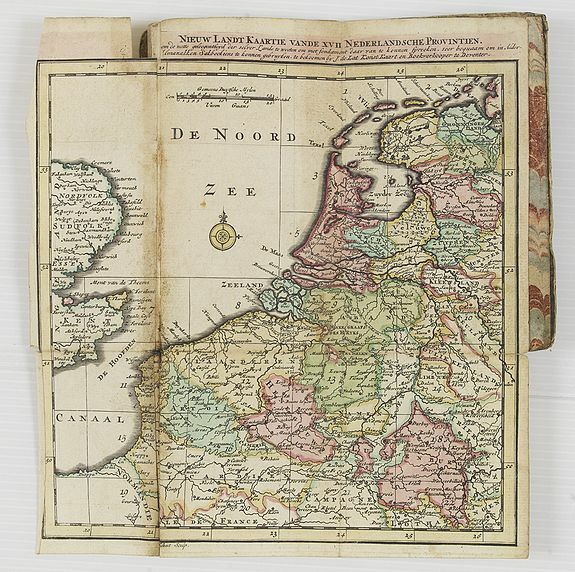 Title : Niew Landt Kaartie Vande XVII Nederlandsche Provintien..
Map maker : LAT, Jan de. Size : 5.6 x 9.2 inches. / 14.2 x 23.3 cm. Description :This travel compendium includes a map of the Low Countries, 2 pages of manuscript notes (dated 23 August 1874) relating to regional miles relating to the meter , and two distance charts between Dutch and German cities. Jan de Lat (1734-1750) was publisher of maps and atlases and a bookseller from Deventer, Holland. Associated with the engraver Jacob Keizer, Jan de Lat published miniature atlases. He worked at Deventer between 1734 and 1750 with the engraver Jacob Keyzer from Almelo as his associate. There is no biographical information about de Lat, but of Jacob Keyzer it is known that he came as a young man to Almelo from Amsterdam in 1706. Condition : Contemp. cardboard cover. Somewhat worn and foxed at the folds. Book cover worn and used. Else good condition.